Thanks for sharing these photographs from your visit. The display of pencil points is a perfect representation of a culture that cares about writing by hand. A friend of mine (the same person who made my visit to Ito-ya possible) sent me a set of the Bosco pencils as a gift, but I don’t think I could ever bring myself to sharpen them. So, thanks for sharing your sharpening experiments! I was able to sharpen the Bosco pencils for a very simple reason: I have two sets (the Japanese price helped). But really, since the reason I bought them was because I liked how they wrote, there was no question of not sharpening them, at least for me. But I think you are wise to leave them unsharpened. Enjoy them as they are! Sola, thank you for such an engaging report! What a compelling store. I love that you sharpened the Bosco pencils. Between you and Ito-ya, there must be at most 198 (or 298) pristine sets now. Regarding Ginza – I see the Tiffany and Bvlgari signs – how “Japanese” is the area today? Stephen, good question. I had to think about it for a while. Although the main street in Ginza has its share of Japanese institutions – I’m thinking of names like Mikimoto (the women of the imperial family wear their pearls), Yamaha (musical instruments), the banks and also stationers like Ito-ya and Kyukyodo – I mostly associate it with foreign luxury brands. They make a point of setting up flagship stores there: all the jewelers, Chanel, Louis Vuitton, Prada etc. I’m looking at Google Maps right now and I see that shops like Apple and Abercrombie & Fitch have also joined the fray since we left. Apart from Ito-ya, I used to love visiting the Nikon and Contax salons in Ginza. This was essentially a small gallery-like space that the companies provided for the benefit of amateur photographers, where they could display their work. I wonder if they are still in operation. Sola, thanks for sharing your thoughts. Visiting London, I had the sense that there was a special area (near St. James Palace) that housed many British heritage brands – James Lobb, Dunhill, Berry Bros., DR Harris, etc., and that the international brands, though nearby (New Bond St.), were still apart. It seemed like a good arrangement (if it is an arrangement). And when you mention Nikon – let me mention that a favorite “unknown” California place I loved when I was there was the Leica store in San Francisco – they had regular photo exhibits, including a memorable Sebastião Selgado show with many of his most famous prints! A 13+ hour flight is a bit intimidating to me, but I’m thinking about it. Oh, now I see why you asked that particular question. London does seem to have a good arrangement – I hadn’t thought about urban areas in quite that kind of way before. And I can only imagine how wonderful it would be, having a print of that caliber before one’s eyes! I only got to know of the photography salons because the librarian at my old primary school in Tokyo invited me to an exhibit of her work at the Contax salon. She had inherited a couple of old Contax cameras from her father and had taken up photography late in life. Even though the “amateurs” exhibiting there are already at a vastly different level than most of us, it’s still less intimidating and feels maybe a little bit within reach, even – which is probably exactly the kind of sentiment these companies want to encourage. Thank you for sharing your experience with us. What an incredible shop this must be. I wonder what the talisman from the last picture is. Could you tell me? I’ve always been curious about the Bosco pencils, so thank you for this post! I learned a lot. I can’t believe I missed them when I was there at Itoya.. looking at your pictures is seriously making me wish I’d spent more time there. 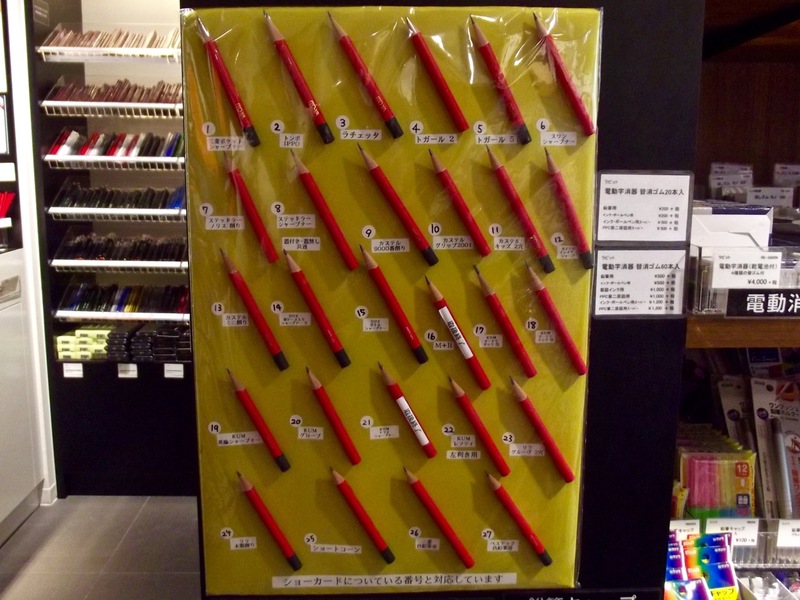 And that display of sharpened pencils is AMAZING.